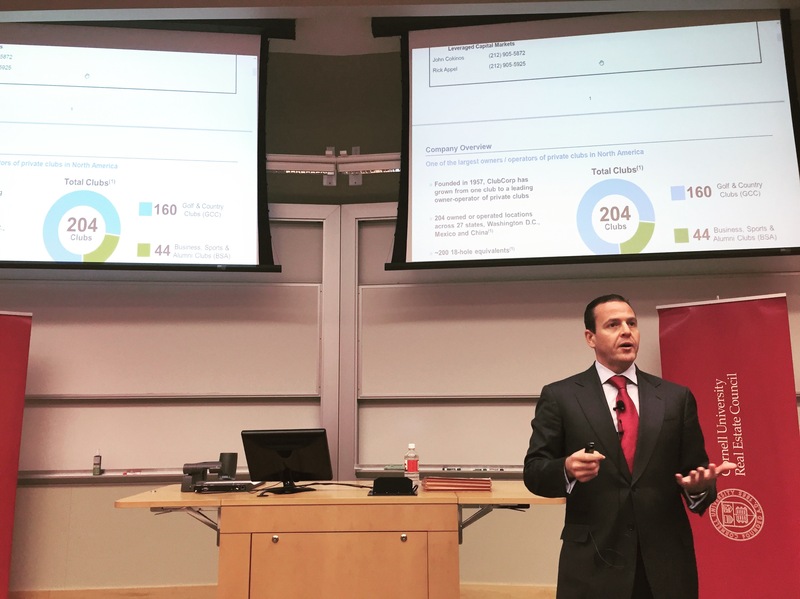 Cornell’s Baker Program in Real Estate was proud to welcome back John Cokinos (Cornell ’95) to our Distinguished Speaker Series on October 26. Mr. Cokinos has led the Royal Bank of Canada’s leveraged loan capital market team since March 2014 as managing director. Prior to RBC he was head of leveraged capital finance markets at Bank of America Merrill Lynch for over six years and a voting member on leveraged finance and underwriting committees. He has also spent ten years at Lehman Brothers with his last role as managing director of high yield capital markets and leveraged finance before joining BAML. With over 20 years of experience, he has overseen a variety of capital markets including Real Estate, Lodging, Financials, Gaming, Industrials, and Healthcare. As an alumni, Mr. Cokinos brought a level of personal connection to Cornell and took students along his professional journey upon graduation. He led students along his career path beginning with one of his first internships working in corporate finance for Marriott Hotels. The following summer, he interned for a real estate appraisal firm in New York City and found the dynamic environment and work to be of particular interest. Through his internship experiences, he realized that he enjoyed working on a variety of deals with a diverse group of clients. With these takeaways in mind, Mr. Cokinos joined Citibank’s investment banking team upon graduating. Amongst the different groups within investment banking, Mr. Cokinos found leveraged finance to be especially appealing as he was able to work with a mix of markets, across various product and coverage groups. In addition to sharing about the personal and professional intuitions that guided his career decisions, Mr. Cokinos generously walked students through a case study during his presentation. The case was from a recent deal Mr. Cokinos oversaw at RBC, assisting Apollo Global Management in the acquisition of Dallas-based, luxury golf resort group, ClubCorp. Students were led through both technical and broader-themed processes in analyzing and evaluating a company whose primary assets were heavily anchored in a specific type of real estate. Throughout the case, Mr. Cokinos and the students examined a wide range of issues. He created an interactive learning environment allowing students to pose both mechanical and theoretical questions. For example, how much are we concerned with the transaction’s percentage of unsecured debt considering the company’s cashflow and value? How do we examine the company’s value while taking into account the changing landscape of golf and golf resorts? How is the golf industry evolving to become more relevant to millennials? The dialogue between Mr. Cokinos and the students provided for an engaging period of active learning and discussion. Learning first hand from industry leaders through real examples makes the Distinguished Speaker Series an exceptionally valuable weekly experience for students in the Baker Program. Having a speaker who experienced life at Cornell and thereafter, brought the conversation even closer to home. In the concluding segment of his presentation, Mr. Cokinos advised students to remain flexible; a lesson he shared with students through his own professional journey. While preparation was important, he encouraged students to be ready and willing to edit plans as they discovered more about themselves through continued exposure to new opportunities and experiences. Students of the Baker Program in Real Estate thank fellow Cornellian John Cokinos for returning as an honored guest of the Distinguished Speaker Series.